By 2031, Hamilton's population is expected to increase to 660,000. A holistic approach to city planning would help develop vibrant and diverse places that people will want to live and stay in: healthier and more sustainable cities for future generations to enjoy. How can policies regarding health and the built environment - urban design, land use, buildings, infrastructure and transportation systems - contribute to revitalization efforts in Hamilton in order to establish a healthy and sustainable community? Healthier built environments can enhance natural environments through conservation of green space and improved air and water quality. They can also provide community engagement opportunities through community gardens and multi-use trails, thus improving social environments. Current revitalization efforts in the City of Hamilton require trans-disciplinary solutions that take into account social, political, economic, environmental and health factors. Car dependency, poor public transportation infrastructure and lack of mixed land use contribute to obesity and physical inactivity. Obesity and inactivity, in turn, lead to an increased risk of coronary heart disease, diabetes, high blood pressure, osteoarthritis, and some cancers including breast, colon, esophagus, kidney and uterus cancer. Public health officials regard the increase in "chronic disease rates associated with physical inactivity, sedentary lifestyles, overweight and obesity" as an "epidemic". 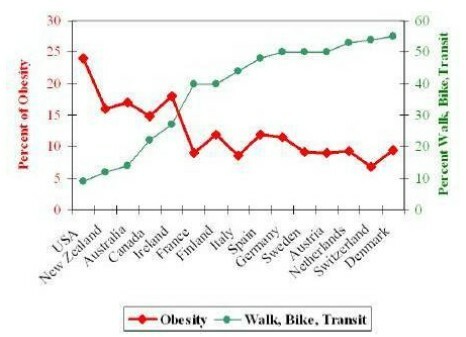 The following chart demonstrates the relationship between obesity and active transportation; obesity levels are lower in places with high levels of active transportation. Canada's physical activity guide recommends building physical activity into daily lives. The guide focuses on meeting the 60 minutes of required physical activity each day by accumulating time throughout the day with various activities, which is why walkability in neighbourhood design is an important factor. Increasing daily walking activities are realistic strategies for people to increase daily physical activity levels. Neighbourhood walkability influences decisions to choose walking as a form of transport. Complete streets describe roads that are designed for safe use by all: vehicles, transit, bicycles and pedestrians. The concept of complete streets is not to focus on individual roads; instead the concept is to change the design process to include all users in the planning, designing, building and operating of all roadways. Complete streets provide more access for all forms of transportation including active forms, such as walking and cycling. Implementing complete streets policies has many health and environmental benefits and helps to better accommodate people with disabilities, seniors and those of low socio-economic status who require affordable and safe options. Street design affects safety, a major public health issue. Over 40% of pedestrian deaths in the US during 2007-08 occurred where no crosswalks were available. The presence of sidewalks, amount of on-street and surface parking, building placement and design, transit accessibility and visual quality improves the safety and appearance of streetscape, as well as the perception of an area's safety and walkability. Street designs that do not support various transportation modes contribute to decreased safety, since driver awareness of alternative transportation modes declines, creating dangerous situations for cyclists and pedestrians. As people spend more time in cars, their risk of being in an accident increases. The Centers for Disease Control and Prevention in the US recently recommended the adoption of a complete streets policy as a strategy to prevent obesity. The case for complete streets is strengthened when considering the costs of physical inactivity and obesity in Canada. The current estimates are $5.3 billion and $4.3 billion in health care expenditures, respectively. Health and GDP have also been linked; the estimated total cost of cardiovascular disease can reduce a country's GDP by 1 to 3%. Therefore, revitalizing the built environment is not only necessary to build healthy and safe places, but will also lead to health care savings. In order to meet the recommendations of Canada's physical activity guide, people require more opportunities to walk and bike to locations. Frank et al (2007) argue that a holistic model of community design that maximizes health benefits would make active transportation both desirable and safe. Municipal zoning in the early twentieth century resulted in regulations to separate residential areas from the "perceived negative impact of mixed uses." The grid pattern planning of the past geared toward pedestrian use was replaced with disconnected networks through suburban development. Design changes in urban planning were based on the assumption that the personal automobile was the transport method of choice for individuals. Zoning, subdivision regulations and building codes originally intended to improve public health, safety and welfare. Thus urban sprawl, which may have originally intended to build safer places, has actually led to the development of unhealthy communities. Smart Growth policies contribute to building healthy communities. Smart growth communities are compact, have well-connected street and sidewalk networks, and support walking and biking more than isolated, automobile-dependent areas, resulting in improved fitness, reduced obesity, decreased traffic accidents and better air quality. Smart growth policies encourage: mixed land use, improvement of roadways to include access for all users (similar to complete streets), and prioritization of funding for alternative transportation. Transportation is greatly affected by land developments and has an impact on the areas in which growth occurs in a city. Alternative transportation is only possible when it is supported by decisions that consider both land use and infrastructure decisions. The complete streets vision varies depending on the place. In urban areas it can include features for all modes of transportation; whereas in rural areas, only a paved shoulder may be required. Complete streets policies require changes that institutionalize the approach. Such an approach involves setting design speeds to allow safe travel for all users. Traffic calming measures include: narrow and reduced lanes, tighter corner curb radii, median landscaping, and curb bulb-outs to shorten pedestrian crossings. Complete streets can include: main street initiatives; bicycle, pedestrian and transit plans; and consideration for disabled users. Supporting polices for and potential challenges to complete streets exist in the City of Hamilton. The complete streets concept will look different in each place; therefore no one formula will work. Many streets in Hamilton could benefit from a complete streets strategy, especially its two main, one-way streets, King and Main, which are major arterial roads that are only designed for motorized vehicles. The light rail transit corridor is being proposed on these streets. Therefore, with its implementation, these major arterials will have to be transformed for more safe and efficient travel for all users. Hamilton's planners focus on healthy community planning. They are members of an Obesity Network that works to improve the health of communities and the built environment. Public Health professionals provide input into Official Plans (OP) and Secondary Plans. Hamilton's Vision 2020 and the new Urban OP (still awaiting provincial approval), have supportive language and a vision for complete streets woven throughout them. Complete Streets is directly mentioned in the OP under Section 4.2.8: Urban Design and Complete Streets, which encourages that design guidelines for secondary plans "shall incorporate" roads that allow for efficient movement through communities for all users. Therefore new zoning and developments could achieve these design changes, as the new OP will force changes in design standards in new developments and support land dedication for sidewalks and bike lanes. Hamilton's Transportation Master Plan and Cycling Master Plan also support complete streets and promote alternative transportation. The International Walking Charter was signed in April 2008 by Hamilton's then-mayor, Fred Eisenberger. The charter demonstrates a commitment of cities to promote and design walkable places to provide active living opportunities. As a result, Public Works and Public Health are working on the development of a Pedestrian Master Plan, a positive example of some trans-disciplinary planning between engineers and health professionals. City Council also recently approved the adoption of Transit Oriented Development (TOD) guidelines as a method to implement the Transportation Master Plan and Urban OP. TOD promotes transit use through mixed use development, higher densities near transit areas, and walkable areas with pedestrian amenities. The Smart Commute program, through Public Works, also supports complete streets. The program focuses on promoting alternative transportation and spearheaded Open Streets, which is based on Ciclovia in Bogotá. This successful event involved the closing of James Street North to motor vehicles for a celebration of alternative and active transportation. Open Streets can serve as a public awareness tool for complete streets if it is held more frequently to initiate behaviour change, as it has done in Bogotá. Certain challenges can hinder the implementation of complete streets. Although supporting policies exist, developers have to see a market for this type of development and the city might have to provide incentives for them to do so. Developments such as the Ancaster Meadowlands, primarily big box stores with car-centred access, continue to be constructed in the city. Public opposition to transportation planning is a major obstacle for complete streets. From lane reductions to new bike lane construction, NIMBYism exists and public education is the key to changing this behaviour. The culture in Hamilton has to change in the development community with regards to urban design. If citizens want to live in healthier places, they can encourage developers to adopt healthier designs by driving up demand for development based on smart growth principles. Another potential barrier exists between planners and engineers in terms of working together towards the same goals. Planners can plan for healthier built environments; however engineers carry out the designs to implement healthier places. More trans-disciplinary planning that involves engineers, planners and public health professionals can mitigate at least some of the challenges that exist. The elements of complete streets policies exist in the City of Hamilton, therefore the following policy recommendations can help achieve the concept in order to revitalize the built environment for a healthier and more sustainable community. The Transportation, Cycling, and soon-to-be developed Pedestrian Master Plans can be integrated into a Complete Streets Policy. Although the language is woven within the OP and the Master Plans, for Hamilton to adopt the complete streets concept, a clear vision is required. Evaluation metrics should be developed to assess the effectiveness of complete streets features implemented in the city. Challenges: Some of the challenges to implementing a Complete Streets Policy are the time, effort and costs required from city staff. A lack of trans-disciplinary planning is not conducive to the type of planning that is required for realizing healthy communities. The city also requires the leadership necessary to advance the policy and someone that will champion the revitalization efforts and focus on healthy communities. Resolutions: The Transportation, Cycling and the soon-to-be developed Pedestrian Master Plan can contribute to the Complete Streets Policy. The work for these plans is completed, thus decreasing the amount of additional work required. Collaborating with other municipalities, such as those who attended the Complete Streets Forum in Toronto, can help Hamilton gain a better understanding of what is required for the policy. A committee that focuses specifically on developing healthier built environments would take action on complete streets and other factors regarding health and the built environment. The committee will only be effective if it crosses trans-disciplinary boundaries. It should include Public Works and Public Health staff, planners, engineers, city council, and citizens. Without an understanding of the interconnections between environmental, social, political and economic factors, healthy public policies cannot be made. Challenges: It will be challenging to gather the right people for the committee, those who understand the need for healthier built environments. There may also be opposition to creating a new committee, since it may not be effective when too many committees already exist. Resolutions: City employees who are passionate about building healthy communities can organize themselves as a coalition to work collaboratively on projects, similar to Public Works and Public Health's collaboration on the Pedestrian Master Plan. Once complete, it can be used as an example to demonstrate that there is a need for similar work to be accomplished through a committee. If there is strong opposition to a new committee, quarterly workshops or an annual summit on health and the built environment could be planned. This would provide opportunities for a diverse range of people to get involved, including students. Recommendation #3: Hamilton Public Health Department should develop a healthy communities toolkit, similar to the Simcoe Muskoka District Health Unit. Creating a similar toolkit would enable staff to develop the language required to support complete streets to put directly into the OP. This would enable them to have policy statements readily available for a Complete Streets Policy as well. Challenges: The main challenge in developing a toolkit is the resources it requires to create it. Resolutions: Staff can use the health unit's toolkit as a template since it is available for municipalities on their website. The health unit has already reviewed the necessary legislation; therefore Hamilton's Public Health staff would just have to change the format to fit with their goals. It would be useful to meet with the health unit for further guidance. Although infrastructure changes are a large requirement to implement complete streets, behaviour changes in citizens is also a requirement and a key challenge. Developing a cycling culture similar to Amsterdam and Copenhagen may not be realistic for Hamilton in the short term; however, it can be a long term goal. Educating the public about the connections between health and the built environment is vital for increasing awareness and influencing land use priorities. Existing networks in Hamilton can unite as one voice to promote complete streets. Environment Hamilton, the Hamilton Cycling Committee, Green Venture, Transportation for Liveable Communities, and Hamilton Walks can collaborate on advocacy, which will also provide benefits for each group. Smart Commute can be used to provide education tools for the community through workshops, more events such as Open Streets Hamilton, and in-school programs, including Stepping It Up. Strong community support is required to demonstrate to policy-makers and city councillors that the health of a city is just as important as the wealth of a city. Challenges: The major challenges include: resources, costs, lack of a central Public Relations office, and resident opposition. For example, Hamilton City Councillor Brian McHattie received opposition for removing parking on one side of Dundurn St. South in order to provide bike lanes on both sides of the street. Resolutions: Although no central PR office exists, Smart Commute can be used as a central promotion tool for complete streets initiatives. Since Smart Commute already exists and has programs in place, these programs can be further developed and focused on complete streets. More resources will be required; however, existing funding through the initiative provides an initial seed. The OHCC can help address the lack of resources since they already work with some communities in Hamilton. The committee on health and the built environment can work with Business Improvement Areas (BIAs) in Hamilton to develop programs on a community level. If BIAs understand the value in complete streets, they can work to make it a priority in their communities. The Code Red Series (Buist, 2010) in the Hamilton Spectator revealed the disparities in health among different neighbourhoods in Hamilton. This demonstrates the need to plan healthier places for all people and to encourage health professionals to become proponents for complete streets. Healthcare professionals need to get involved with health and the built environment advocacy since they can provide a strong voice in the discussion on community health. A fundamental challenge to instituting a complete streets policy is the lack of holistic approaches to training in transportation related fields. Training engineers, urban planners, technicians, policymakers and health professionals about complete streets is necessary for successful implementation. If this training is provided in undergraduate and graduate school programs, a new age of planners, engineers, technicians, etc, will be equipped with the necessary skill set and will understand the need for this type of planning. Challenges: Finding the expertise and the funding to develop these programs is a challenge. This recommendation also requires a change in undergraduate and graduate programs to reflect healthy community planning, especially within engineering disciplines. Resolutions: The Regeneration Institute for the Great Lakes (REIGL) can assist with providing training for engineers, technicians, municipalities and other professionals. REIGL is focussed on training and educating municipalities, practitioners and students on concepts surrounding restorative development in the Great Lakes region. The development of a Complete Streets Policy for the City of Hamilton would help the city focus on addressing the relationship between health and the built environment. The policy would assist with achieving the recommendations of the Transportation and Cycling Master Plans, while also fulfilling the requirements of the Urban Official Plan and Vision 2020. Alongside of supporting their plans, the policy will also address the high overweight and obesity levels in the city through the promotion of active transportation. The potential success of revitalizing the built environment through complete streets will not come without public support. The city and its citizens should work together to improve their health and the health of the community in which they live. The complete streets examples from other cities around the world demonstrate the means of providing more complete, sustainable and liveable streets. Through the implementation of the recommendations outlined in this study and learning from the examples provided, the City of Hamilton has the potential to establish a healthy and sustainable community for current and future generations. Editor's Note: this article is excerpted from Maria Topalovic's Master's Inquiry Thesis, which you can read in its entirety here [PDF]. Good job Maria! !it's so nice to know somebody like you who is concern about the welfare of hamilton and its residence.